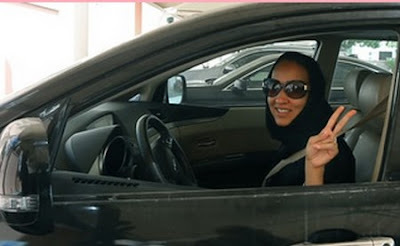 I read that the Saudi ruler's decision to allow women to drive is a turning point in a society where roles have long been rigidly and far from being equally distributed. Inevitably, the comprehensible resizing of the alleged conquest will spontaneously arise, concerning the road that is still to be done realizing a modern idea of equal opportunities. That’s a mirage not only in Saudi Arabia, isn’t it? However, before you take breathe and steal time and page, I start and look for the horizon still to fill. With one eye on tomorrow, the dreamed oasis, on the shore touched just within my imagination. At the same time, the other half of my heart rejoices, staring at the missing rest that makes vibrating my chest and rubbing my hair. I can think of what you don’t have the courage to look at. I can breathe in time with my own aspirations and aspire to the time when I will breathe victories and defeats in the only shadow of my shamelessness. Today I can say loud what I could best whisper yesterday. I can watch the dark passages of the past fears and pass through today's darkness without fear to be watched. I can drive, yes I can. I can drive the car and also my body where the body itself will find fate. I can cross the drawing that separated before from after as if it were right and draw the only right that should change before in after. I can, yes it is. I can touch what I feel alive in the light of my eyes and yours. I can wear the nothing of the world that scandalized the nothingness on the surface and annihilate the superficiality that the real scandals of the world were giving to us. I could before, if you know what I mean, paying an unacceptable price. Common currency in places where sacrosanct right is disguised as a crime. So, before you can lower the music and turn off the lights, I will be far away. Unreachable and free from every painfulness of the present time. Buy my English edition books Italian Short Stories, a dual language book, Climate change stories, a dual language book, Stories of diversity, a dual language book and Multicultural stories for kids.